3-Ethel Elizabeth Goss was born on 1 Mar 1885 and died on 10 Jul 1978 at age 93. Ethel married Thomas Lowery. Thomas was born on 15 Sep 1877 and died on 31 Jul 1953 at age 75. They had no children of their own, but happily fostered twin boys, Watty and Len Rutter, who had come from New Zealand. Both were keen footballers, playing with Barrington and later with Hawthorn and South Melbourne. Len died some years ago, and Watty is currently living in South Australia. 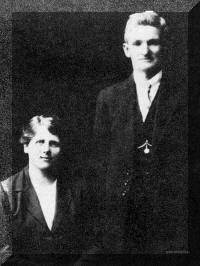 Thomas died in 1954 and Ett then moved to Devonport, dying at Tasma House in 1978.